Taking cues from their surroundings, couples opt for personalized weddings filled with locally inspired accents. 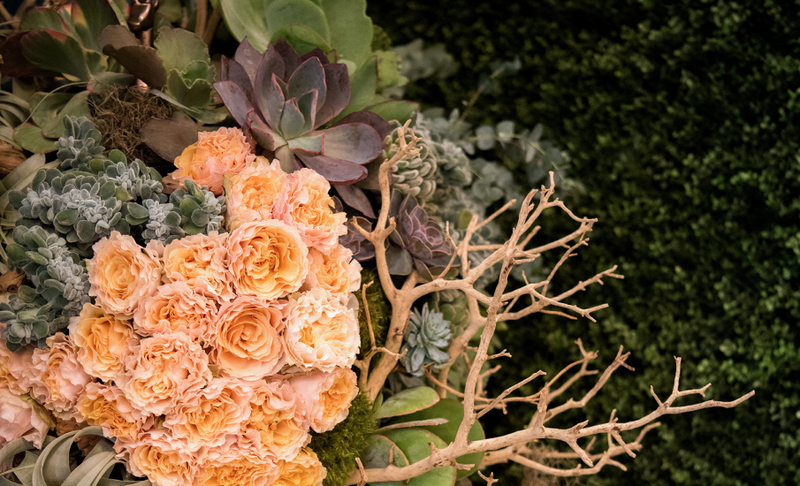 The shift, Korman maintains, has happened partly in response to the Pinterest craze and its do-it-yourself ethos, a mentality that’s put the wedding-trend machine in overdrive ever since the website launched back in 2010 (remember Mason jars?). “My clients will usually say, ‘I saw something on Pinterest that I’ve seen a million times, and I don’t want to do that,’ ” she laughs. “They’re looking to us to come up with ideas that aren’t on Pinterest—something more unique.” Embracing a wedding locale’s history and community ultimately becomes a springboard for conceiving fresh ideas that haven’t yet been homogenized. “It is also about highlighting what is meaningful to the couple,” Korman adds. “[People] choose to get married at Sea Island for a reason, and you don’t want to overshadow that. You want to highlight the oak trees and the Spanish moss and the low-country look of everything.” Luckily, couples will find no shortage of creative inspiration when it comes to infusing local character into their Southern ceremonies’ food, décor schemes and traditions. One of the most obvious ways to evoke a sense of place is through flavor, so it’s crucial for couples to pay particular attention to their weddings’ food-and-drink selections. “I always encourage shopping locally and utilizing community vendors to help build out your ideas,” Popa says, adding that greeting guests with personalized welcome bags or baskets is a surefire way to positively shape their first impressions of the new surroundings. Locally sourced treats—think boiled peanuts, homemade candies and artisanal preserves—as well as Georgia-specific products, like glass bottles of Coca-Cola and fresh peaches, make for thoughtful, creative souvenirs for guests. When it comes to the food that’s showcased at the reception, don’t be afraid to think outside the box and play with popular regional ingredients in surprising ways. “Instead of featuring Georgia peaches at every place setting, think about setting up something like a peach Bellini bar,” Korman suggests. “You might not be able to keep inventing new things over and over, but you can certainly customize them.” Likewise, serving bespoke, wedding-themed cocktails made with craft spirits from Southern distillers at a pre-reception cocktail hour sets the tone for an evening focused on honoring and developing traditions. At Sea Island, weddings get extra boosts of local flavor courtesy of the fully functional garden that’s part of the resort’s famed hunting club, Broadfield, A Sea Island Sporting Club and Lodge. “We usually incorporate our homegrown baby vegetables and herbs into all our wedding dinners,” Popa says of the bounty, which changes seasonally as new crops reach peak ripeness. “And because pimento cheese is really big here, we also do these great pimento cheese fritters and sandwiches throughout the day.” Additional handheld delicacies, such as fried green tomatoes and chicken salad lettuce wraps, can help round out a culinary spread and serve as fitting precursors to more traditional main courses or a buffet of satellite-style food stations. As the evening draws to a close, opt to send guests off with something slightly more memorable than a standard slice of wedding cake. Grab-and-go cookies shaped like the state of Georgia, chocolate-dipped moon pies and even sugar-dusted beignets will ensure the festivities are remembered long after the last dance. Refining a wedding’s overall look can also lead to new opportunities for embracing a region’s aesthetic. To get the strongest visual feel for a place, Natalia Scott Perkins, designer and co-founder of the Atlanta-based event styling firm Tailor & Table, recommends first researching the history of a wedding locale’s surrounding area. “Read about things like how the area was first settled and what influenced its architecture,” Perkins advises. “Usually when you start brushing up on a place’s history, you’ll end up finding something inspiring along the way.” To weave in even more of a community’s local fabric, source temporary furnishings, linens and tabletop décor from neighborhood rental companies, home boutiques and antique stores. Because most destination weddings tend to be Friday-through-Sunday affairs, Korman encourages couples to plan a variety of activities that’ll allow out-of-town guests to more actively immerse themselves in their surroundings. Start the weekend with an authentic oyster roast or shrimp boil, and cap off the festivities with a post-party farewell brunch. In between, schedule outings like historic neighborhood tours, Southern cooking classes or fishing excursions. “I just always remind couples not to overplan, because people do enjoy some free time to explore,” Korman cautions. Of course, at Sea Island, it isn’t hard to fill an itinerary. Guests have access to everything from beachfront horseback rides to full-day sessions at Broadfield, which lead to cherished memories.